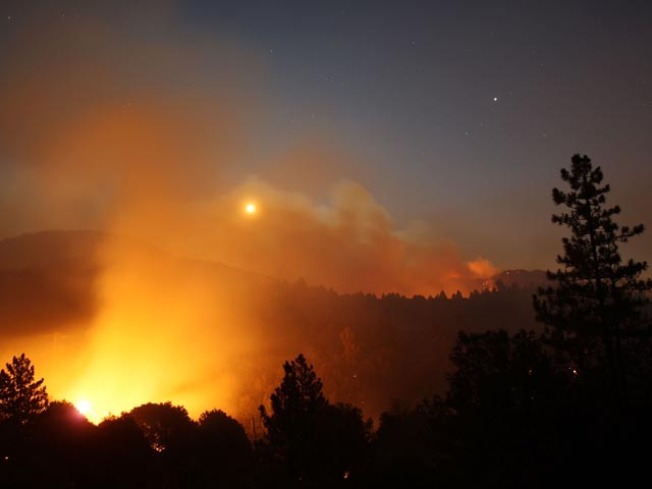 The 241-square-mile Station Fire continues to blacken forests and race up rugged canyons along its eastern front deep in the Angeles National Forest on September 4, 2009 northeast of Pasadena, California. Firefighters plan to burn back heavy brush to contain the deadly fire north of Los Angeles, so residents of the foothill cities near the San Gabriel Mountains should expect to see more smoke boiling out of the Angeles National Forest. As the Station fire entered its thirteenth day Monday, officials said the blaze was 56 percent contained at 157,220 acres or 246 square miles. Incident commander Mike Dietrich says residents of Pasadena, Sierra Madre, Arcadia, Monrovia, Duarte and Azusa may see heavy smoke and firefighters working in the hills on the eastern flank of the fire. Because of the deaths of the two firefighters, Los Angeles County authorities are conducting a homicide investigation into the fire, which was ruled arson last week.